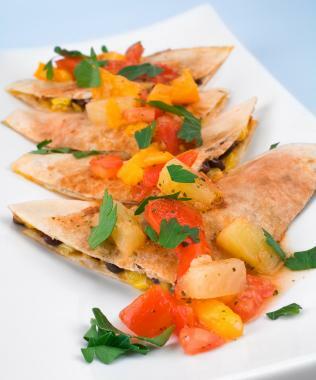 An island spin on the everyday quesadilla. This simple dish is full of flavor. Watch as its vibrant taste comes alive when the jerk flavor is added. 2 lbs boneless skinless chicken breast. Preheat oven to 350 degrees. -Bake chicken for approximately 30-45 minutes until fully cooked -Remove from the oven and let cool slightly. Shred the chicken and add to a 4-quart sauce pan. Add the JCS Boston Jerk Sauce and JCS Boston Jerk Seasoning stir and let simmer for 25 minutes. Meanwhile heat a sauce pan over medium-low heat. Place a tortilla in the saute pan. Place a small amount of the shredded cheese on one half of the tortilla. Place a spoon full of shredded jerk chicken on top of the cheese and place another small amount of shredded cheese on top of the Jerk. Fold over tortilla,then once cheese begins to melt, flip over and let sit until all cheese is melted. For Calypso Salsa, put all ingredients in a bowl and mix together. Ready to serve!